Its going in the box! Henry – look what I’ve got! Nine of our riders went along to Lowlands, including several newbies. Everyone rode with skill & determination & it was a very successful day. All the practising beforehand definitely paid off! Everyone took part in the Handy Pony course, with some very high scoring rounds. Congratulations to first-timer Sasha, riding Kiera, who was well deserved winner of the junior led class. His score of 91 was the best result of the whole day & Sasha won a lovely trophy, to keep for a year. Isabella on Henry was a very close second, going on to win the unled section too! Henry, ever the showman, rose to the occasion, steering Marco into sixth place. Lewis on Marco was positive & very focussed, Arthur was very excited to be riding Badger & Harrison put in a good performance on Marco. They all scored over 70% and were awarded special rosettes. Our riders once again dominated the senior led class, which was won convincingly by Matthew A, riding Badger. Matthew completed the whole course unprompted. Well done to his team of helpers for allowing Matthew as much time as was needed to complete each activity. Jo P showed good skills on Kiera to achieve second place, and Holly on Badger, completed all the activities with enthusiasm, (particularly trotting!) to win a third rosette. All our riders also successfully took part in a “clear round” showjumping class. They enjoyed steering round a course of poles and were awarded rosettes for showing the correct approach & forward position. Whilst results are important, I was immensely proud of the confident, happy, positive attitude adopted by all our riders throughout the day. The excitement in simply being on their ponies & taking part was obvious. Isabella proved her knowledge of grooming & looking after ponies by coming third in the Stable Management quiz. Sasha’s research on the internet gained him a 5th rosette & Matthew A was 6th in a highly competitive class. The day was rounded off with a picnic, followed by the prize-giving, when our riders proudly collected their rosettes. 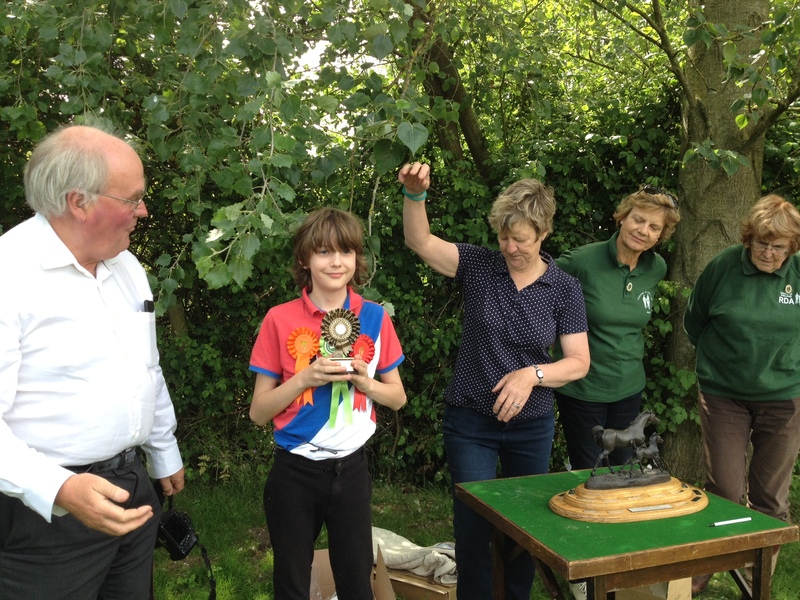 It was lovely so many parents, carers, riders & helpers were present to celebrate Donna receiving the “Warwickshire Trophy”. A very well-deserved recognition for the endless time & effort given to our Group, especially as the driving force behind the installation of our amazing lift. Well done Donna! Special mention goes to Marco, Kiera & Badger. Their behaviour & willingness to please was much admired. They give our riders such confidence & truly are a credit the Group. Finally huge thanks to all our helpers, who enable our riders to have such fun & achieve so much – not just on the day but all the practising beforehand, tack cleaning & grooming.